Who would have thought a sous vide machine for the home cook would have come from the taste of an excellent pork chop? We spoke to the husband and wife team, Drs Michael and Mary Dan Eades, who were responsible for bringing the sous vide out of the commercial kitchen and into the home. It all started back in 2008, when nutritional experts Michael and Mary Dan Eades had one of the best pork chops they had ever eaten in their lives. Coming from the Southern states of America (known for their love of barbecues and grills), they’d been exposed to plenty of well-cooked meat in their time, but a pork chop in a hotel restaurant changed their entire outlook on how meat could be cooked. The couple were extremely surprised to find that at that time, there were no domestic versions of the sous vide machine available; even the least expensive model cost over $1,500 and looked like something out of a science lab. Initially, they cobbled together a make-shift contraption that consisted of a large stock pot balanced over a gas burner atop a simmering ring from an old wok. They hooked a sugar thermometer to the side and the two of them kept watch and added ice cubes or hot water minute by minute to control the temperature. Clearly this wasn’t going to be suitable for everyday use, or for other households to try and replicate. Both Michael and Mary Dan had written books on nutrition and had long promoted a low carb/high protein diet, but neither had ventured into culinary technology before. So, together with a team of designers, manufacturers, and culinary professionals, they developed the SousVide Supreme™ water oven in late 2009. This became the world’s first self-contained machine for sous vide cooking. 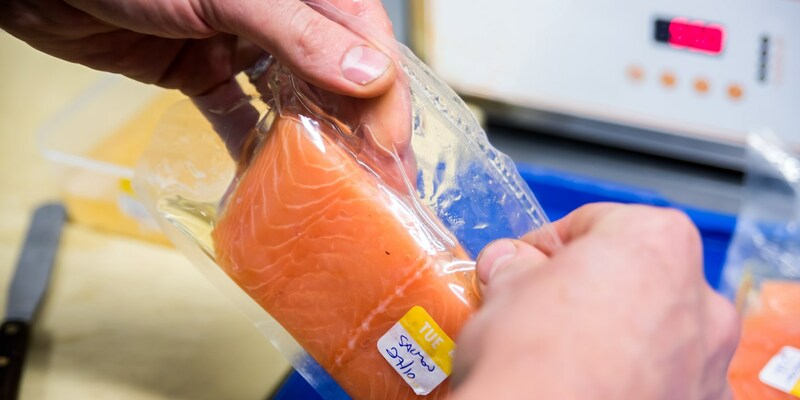 Since then the SousVide Supreme has quickly evolved into a leading culinary brand for sous vide cooking, both for home cooks and now culinary professionals using their range of affordable water ovens, vacuum sealers, sous vide accessories and cookbooks. Heston Blumenthal was passionate about the sous vide method of cooking and when he tested the domestic models at The Fat Duck he said they worked just as well as commercial models. In fact he was so impressed, along with the Eades, he went on a US tour of cookery schools, restaurants and colleges to show how the machines could revolutionise food. Each town they visited was mobbed by the public and chefs who all wanted to meet Heston and sample his dishes, ranging from expertly cooked salmon, to compressed aubergine and poached pears. The sous vide had changed his life as a restaurateur and enabled him to cook food to an extremely consistent quality. Sales of the SousVide Supreme bubbled along, but in 2011 the water oven was awarded ‘Best in Category for Cooking Electrics’ at the Housewares Design Awards. Since then sales continued to grow and the brand became much more widely accepted. You’ve never had a beetroot until you’ve had a sous vide cooked beetroot. It intensifies the flavour so much it’s like eating candy. No taste or nutrients are lost. One of the most convenient things about sous vide cooking is that it keeps food perfectly cooked, at serving temperature, until you’re ready to eat it. If you never heat the meat past 56ºC/134ºF, it will never overcook. The method has had rave reviews from those on a Paleo diet (steering away from processed foods) and people who love grass-fed meat. Meat farmed this way tends to be full of flavour but quite tough, so the sous vide method really tenderises the meat by allowing that precision control over the way it is cooked. This technique is also perfect for entertaining as you can begin preparing the meal a few days ahead of time. Once cooked, the vacuum-sealed components can be kept in the fridge until the event, then finished off in a pan or under the grill to reheat or add a seared crust before serving. It also allows for late arrivals at dinner, as each part is already cooked through to the exact same level, and thus avoids the risk of overcooking and drying out. Our thanks to Drs Michael and Mary Dan Eades for spending time with us while they were in London.